Successfully Added Natural Bamboo Keyboard and Mouse Combo to your Shopping Cart. In Confucius Ideology, Bamboo represents the true noble men, those who gain inner peace through being virtuous. When our supplier uses natural bamboo, a symbol of Confucius culture to produce this keyboard and mouse combo, they create a unique product that evokes in the users a deep feeling of peace, calm and tranquility. This handcrafted Natural Bamboo Keyboard and Mouse Combo not only looks unique and trendy, it also helps you improve productivity. The laser engraved bamboo keys absorb sweat, stay clean and feel comfortable. In addition, the extra four shortcut keys give you easy access to internet, e-mail, mute and calculator. 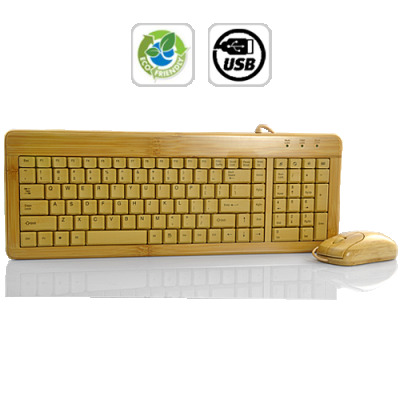 Google "Bamboo Keyboard and Mouse" to see how much these products sell for online. Notice how they normally retail for close to 3x the price we're selling them for. Even if you don't intend on buying one for yourself, stock your online store with these unique products to lock in some amazing profits! Brought to you by the leader in direct from China wholesale electronics - Chinavasion. Why are bamboos sustainable and eco-friendly material? Bamboos are some of the fastest growing plants in the world. They are capable of growing 60 cm (24 in.) or more per day due to a unique rhizome-dependent system. They can do self-generation of its forests on the earth. The bamboo materials are biodegradable and anti-bacterial.